Don Draper did so many despicable things during the past season of Mad Men, that not even all the glimpses of his troubled childhood could get me to sympathize. 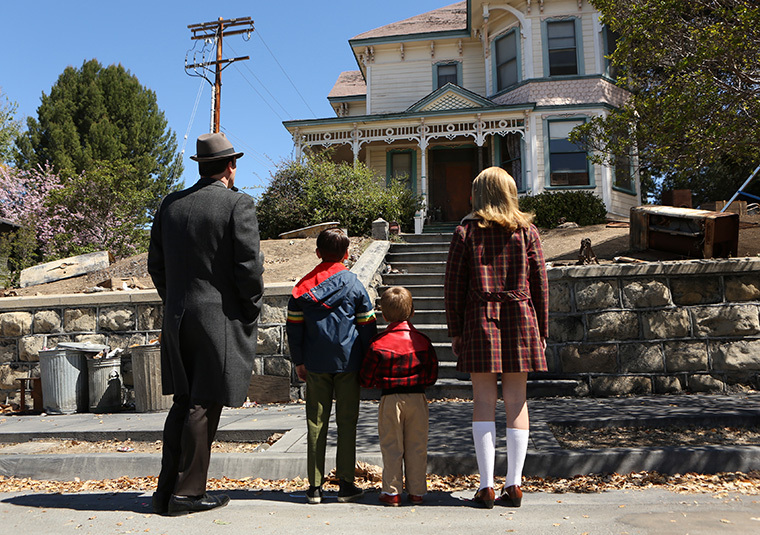 But while watching the last scene of the season finale, in which Don – that master of spinning the truth – shows his children the run-down house he grew up in, tears filled my eyes. “Both Sides Now” was playing in the background, and this song about truth, clouds, and illusion, coupled with a glimpse of Don finally being honest about his past, made me see all the prior glimpses in a new light. It was the perfect ending, the sort of moment that storytellers long for, and that in my struggle to deal with the past in my novel, I’d almost forgotten about. Change the decade? Well, that was not what I expected to hear. I’d set my book in 1965 partly because the crime it is based on took place then, but also because — as shown so well in the first season of Mad Men — it was a turning point. The Sixties were becoming less like the Fifties. The Beatles still wore suits and ties and looked like ‘nice young men’. They hadn’t taken LSD yet, though friends of mine had. There were whispers of revolution, but I was too preoccupied with finding the perfect dangling earrings or go-go boots to notice. That year, poised on the verge of change, felt like the ideal backdrop for my young protagonist’s journey out of innocence. When my time with the agent was up I fled to the bar, found some friends, and downed multiple glasses of wine. I attempted to focus on the positive — like the fact that she liked my writing, and it was just one person’s opinion. But at home that night, I did the author equivalent of drunk-texting, and changed every Sixties reference in my first chapter to something contemporary. I gave my protagonist a love for vintage clothes, and threw in an iPhone. Lawrence Welk morphed into Law and Order. Fortunately, my writing friends set me straight. They said it would take more than a cultural ‘makeover’ to get my book out of the Sixties. I was going to have to rewrite it — if that was what I really wanted to do. I had no idea. So I indulged in some hysterical thinking. Did today’s teens really have the attention span of gnats? If I somehow managed to make my book contemporary, would my changes be out of date before I clicked send on a query? What was time anyway? Were we moving into an age when only the Remembrance of Things a Nano-Second Ago mattered? And then I put my novel aside for a few months. In the meantime I read a couple of terrific YA novels: The Perks of Being a Wallflower by Stephen Chbosky and Looking for Alaska by John Green. Neither book took place in the present. To be honest I couldn’t tell when they took place. There were mix tapes, pay phones, and a conspicuous lack of texting. Yet teens still read them, because the story was what mattered. I decided it was time to stop my hand wringing over whether to be in the Sixties or not to be in the Sixties. I took a deep breath and started a new revision. Though I didn’t change the decade, I cast a cold eye on my cultural references. If they weren’t essential I cut them. I avoided specific dates, and let my story float in time. I replaced all mentions of Vietnam with words like overseas or enlisted. I’d never liked those references anyway, perhaps because the war existed only in the periphery of my young protagonist’s consciousness, much as it had only been on edges of mine — secondary of course to my white go-go boots. The songs were harder. “Both Sides Now” meshed perfectly with the last scene in Mad Men, because you could actually hear the song. Maybe with the evolution of eBooks we’ll eventually be able to click on a song in a book and hear it, but I couldn’t assume others would recognize the songs in my novel. If I referred to a song in a scene, the title or lyrics would have to resonate with it. So I changed some songs, eliminated others, and had fun finding Sixties’ tunes so obscure no one would know when they were from. “Violets of Dawn” anyone? When I was through my book was still set in 1965, though more subtly. More importantly I believed in my story again. This time I didn’t drink heavily, rush home, and change everything. Though I cautiously reintroduced the word Vietnam in a couple of places, I kept the rest pretty much the same. I know that in writing about the Sixties, I am revealing the past to an audience that (the market would say) cares only about the present. But I also know that moments that give us a glimpse of something from more than a nano-second ago – moments like Don Draper revealing his past to his children – are the moments that matter. All the rest is clouds and illusion.